Finally, we have one newspaper delivered today which is really good. It was just annoying to keep receiving two newspapers for almost a month. We called the Sentinel 1-800# and was connected to a representative from some country outside the US. Nothing happens and they make things complicated. 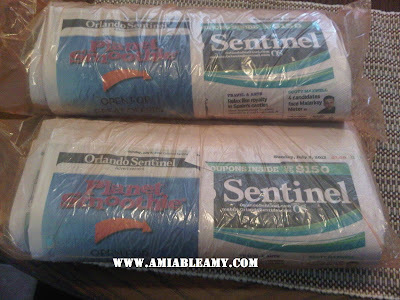 Anyway, we were able to speak to the Editor of the newspaper in Orlando and they were able to fix it the next day. What a big relief! We love Sentinel!